This Organic Gardening Kit makes both indoor and outdoor organic gardening easy - everything you possibly need to care for and grow your plants, in one convenient attractive tote bag! Organic and Natureâ„¢ products are safe for both indoor and outdoor use and are made from food-grade ingredients. They are safe for children, adults, pets, plants, vegetation and the environment. They do not pose any of the health risks or groundwater issues associated with chemical-based agricultural products. The garden tools make a welcome gift for gardeners. The steel blade of the pruner is ground for smooth cuts and maintains its sharp edge. The lightweight handles have comfortable grips. It is ideal for singling out a stem in a flowerbed or for thinning container plants. The snippers have a long-lasting precision spring, with a grip that limits hand fatigue. The Organic Plant Booster is a natural plant stimulant containing no harmful chemicals; the Organic Plant Food with Kelp provides key nutritional elements and promotes healthy soil conditions; and the Organic Soil Infusion is an all-natural additive that helps strengthen and stimulate plant growth. 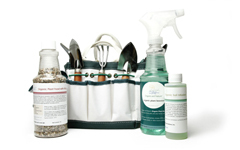 This Organic Gardening Kit sells in the Horticultural Society of New York's Gift Shop for $39.99!